Check out the latest episode of The Weekly, where the Topic: Thunder guys discuss a week that ended with a loss to Dallas, the upcoming week of 3 games, and about the news and notes around the league. In a season that started off with championship aspirations, the Oklahoma City Thunder still find themselves in a position to achieve that goal, albeit a lot lower in the standings than previously envisioned. If healthy, the Thunder would clearly be atop the Western Conference standings. But as is the case when the words, “if healthy,” are used, the Thunder this season have been anything but healthy. Of the players currently on the roster, the Thunder have lost about 164 games due to injury. That figure would likely rival the last 5 seasons combined. Regardless of all of this, though, the Thunder are still firmly entrenched in the 8th spot of the Western Conference with 10 games to play. Their magic number to clinch a playoff spot is 8. Anytime you are in the middle of a playoff race, you always have to look at the teams you are trying to gain ground on and the teams that are looking to gain ground on you. You watch out for, not only your team’s scores, but also the scores of those teams you are looking out for. Here’s a look at some of the teams who fortunes directly affect the future of the Thunder’s playoff hopes and beyond. After the trade deadline, Phoenix had to adjust after trading two of their top three guards (Goran Dragic and Isaiah Thomas). While they gained Brandon Knight, the adjustment period did cause the Suns to lose 7 of their first 11 games after the All-Star break. 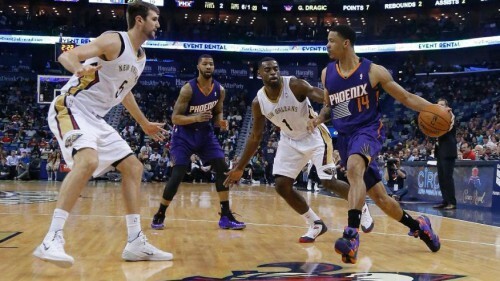 That spurt allowed the Thunder and New Orleans Pelicans to push ahead of the Suns in the battle for the 8th spot. The Sun have probably the toughest remaining schedule of the three teams looking for the 8th spot. Not only is the winning percentage of the teams remaining on their schedule .630, six of those ten games are on the road. 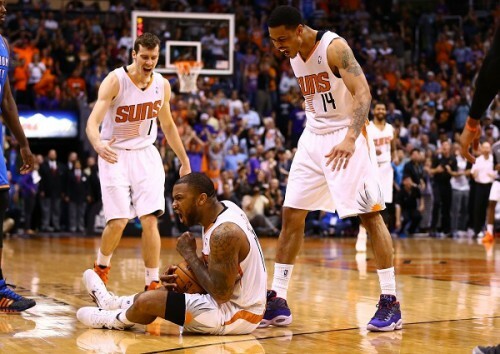 The only solace the Suns can take is that some of those teams may be resting players in preparation for the playoffs. While the Pelicans have a much easier upcoming schedule, they are still dealing with injuries to two key players. Point guard Jrue Holiday remains without a timetable and Ryan Anderson is still about a week or so away from returning. The lack of depth in their guard rotation has started to rear its ugly head in the last few close games. Tyreke Evans and Eric Gordon have had to log major minutes in the last two months, and seem to be tiring at the end of games. Anthony Davis is doing everything he can to help the Pelicans, but teams are starting to double him in the post. If the Pelicans are going to make any moves, it’ll be in the next four game, as their next four opponents have a winning percentage of .307. The Thunder had a golden opportunity to make up ground on the Spurs last night, but watched that wilt away before halftime, as they fell behind by as much as 30 points in the 3rd quarter. The Spurs’ remaining schedule is not easy, but, luckily, they play the more difficult opponents at home. In year’s past, the Spurs would usually rest their players during this stretch of the year, but with the Mavs and the Thunder on their tails, the Spurs will likely not be doing that so much this season. The Mavs have been prone to inconsistencies of late (6-7 in their last 13 games) and may still be suffering from chemistry issues. Monta Ellis’ effectiveness hasn’t been the same since the Rajon Rondo trade and the Mavericks’ big man depth is questionable. They struggle a bit on the road and have two 3-game road trips coming up. The Thunder have one more game against the Mavericks and it comes at the back end of a tough 3 game road trip. If there is a team that may relinquish their positioning, it may be Dallas. While the Wizards’ fortunes hold no bearing for the Thunder’s playoff implications, they do hold significance for the Thunder’s first round draft pick. The Thunder currently have a better record than the Wizards which would give them the 19th pick in the upcoming draft. The trade that garnered Dion Waiters for the Thunder came at a cost of the Thunder’s first round pick. That pick had a restriction of Top 18, meaning that if the pick was in positions 1-18, the Thunder would keep the pick. If the Thunder were to pick in the 19-30 spot, that pick would be conveyed to the Philadelphia 76ers (via Denver from Cleveland). If the Thunder and Wizards finish with the same record, the position of the pick will be decided by a coin flip, with the winner of the flip getting the 18th pick. The Thunder are firmly in the 8th spot in the West. Their playoff destiny could be decided in the next 6 games. They have a tough 2 game road trip remaining (@Phoenix and @Utah) and then play the Texas triangle and Memphis after that. Come out of that gauntlet with a winning record, and you control your playoff destiny. Finish less then .500 in these next 6 games, and things could get very harry. This is my favorite time of year to not only watch the games involving the Thunder, but also watch the games of the teams that can affect the Thunder’s future. Here’s to the last 3 weeks of the season. When you are in the hunt for a playoff spot, you always look in two direction: the teams ahead of you in the standings and the teams you are warding off. Now that the Oklahoma City Thunder are firmly in the 8th spot in the Western Conference playoff race, the most important task is staying ahead of New Orleans and Phoenix. Catching up to San Antonio and the Clippers would be nice, but with the main objective already met (getting to the 8th seed), it’s all about maintaining their current positioning from here on out. This is the third meeting of the season between these two teams. The Thunder have won the previous two games. The first game was a blowout with Oklahoma City winning 112-88. The second game had a playoff feel to it and even had some extracurricular theatrics that ended with Russell Westbrook being ejected from the game right before halftime. 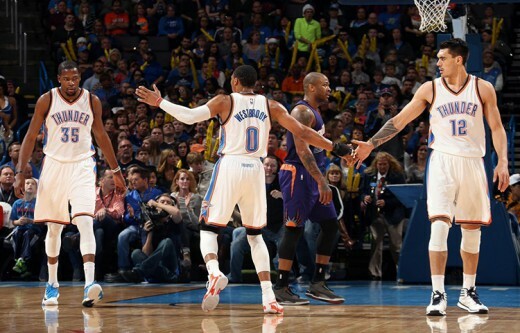 Kevin Durant carried the team in the 2nd half and they eventually outlasted the Suns in overtime, 137-134. The Phoenix Suns come into this game with a 30-28 record, good for 10th in the conference (2.5 games back of the Thunder). The trade deadline completely changed the look of the team, with Goran Dragic, Isaiah Thomas, and Miles Plumlee being shipped out in separate deals that basically netted the Suns Brandon Knight and trade fodder. 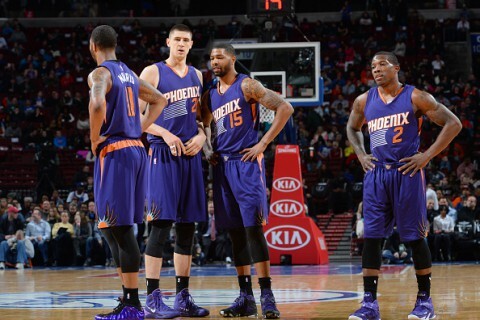 It should come as no surprise that the Suns have struggled, losing 8 of their last 10 games. While still a high scoring outfit (106.1 points per game – 3rd in NBA), they allow the 3rd most points per game (105 points per game) and are 18th in the league in rebounding. With the departure of Dragic, Bledsoe becomes the undisputed leader of the team. Joining Bledsoe in the backcourt is the aforementioned Knight. PJ Tucker takes on the position of 3 and D wing, and is one of the more underrated ones in the league. Up front, Markieff Morris and Alex Len give opponents a contrasting front court, with Morris being more perimeter oriented, and Len being more post-oriented. Off the bench, Marcus Morris, Gerald Green, and Brandan Wright give the Suns an explosive reserve unit that can be a problem if they get hot. 1. 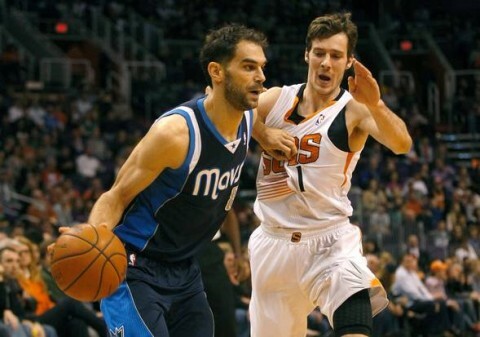 Perimeter Defense – Outside of Alex Len and Brandan Wright, everyone else on the Suns is perimeter-oriented. Brandon Knight and Eric Bledsoe do a good job of serving as facilitators, while everybody else waits on the perimeter for an open shot. It starts with keeping the two guards in front of the defense. If Westbrook, Roberson, DJ Augustin, and Dion Waiters are up to task, this should mute the effectiveness of the Suns’ attack. 2. Rebounding – Being such a perimeter-oriented team keeps a lot of the Suns players outside the paint. Hence their No. 18 ranking in rebounds per game. The Thunder on the other hand, usually have at least 3-4 players crashing the boards on the defensive end, while the Thunder bigs are known for crashing the offensive glass. Keeping the Suns to one and done on the defensive end of the court, while grabbing a couple offensive boards on the other end of the floor will go a long to securing the victory in this game. 3. 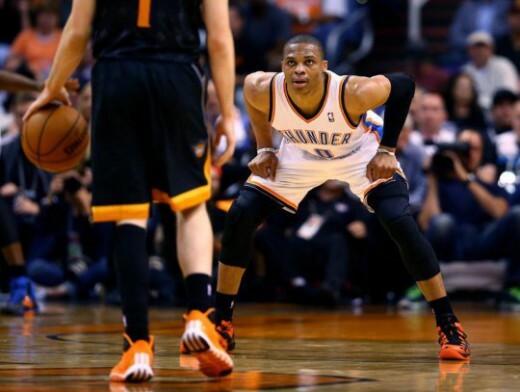 Russell Westbrook – He’s reaching the point where Durant was last season when he was bestowed the name Slim Reaper. The point where it is must see TV to see what crazy stat-line Westbrook will put up. Everyone keeps saying his play of late is not sustainable, but he’s not doing anything different than he’s done throughout his career. While positions 1 through 7 are well represented and accounted for in the Western Conference playoff picture, the 8th spot is looking like if Kim Kardashian announced she was newly single at the BET Source Awards. Six games currently separate the 8th seed from the final seed in the conference. With a quarter of the season already played, there is still plenty of time for teams to make their moves to get into that final spot. One of the best things for a team to do in this position is to assert themselves by beating the teams around them in the standings. For the Thunder, those teams would realistically be the Suns, Pelicans, Kings, Nuggets, and Lakers. The Jazz and Timberwolves have little shot of moving up in the standings due to their inexperience and general direction of their team currently (rebuilding, player developing, etc.). 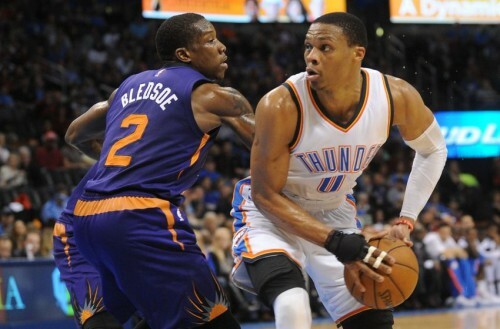 This is the first of four meetings this season between the Thunder and Phoenix Suns. The Suns’ run and gun style gave the Thunder issues last season as the Suns won 2 of 3 games in the season series and averaged 115.3 points per game in those three meetings. The Phoenix Suns come into this game with a 12-12 record, barely clinging on to the 8th seed in the Western Conference. After starting the season 9-5, they’ve gone on to drop 7 of their next 10. While the offense is still there (105.4 points per game, good for 5th in the league), the Suns have slipped defensively. They allowed 103.9 point per game (26th in the league) and grab only 41.8 boards per game, which is 19th in the league. As high-octane as their offense is, a lot of it is predicated on one on one play and perimeter shot making, which can make it inefficient at times. 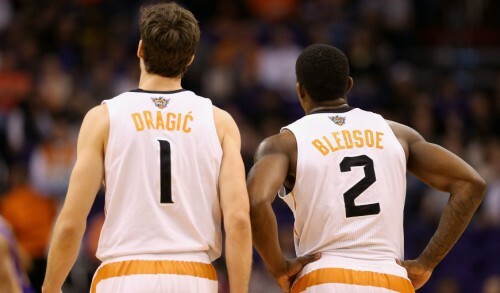 Leading the charge is the two-headed point guard duo of Eric Bledsoe and Goran Dragic. Bledsoe is the havoc creator, while Dragic is the more efficient player. Between the two, they are averaging nearly 32 points, 8.5 rebounds, and 10 assists per game. On the wing, PJ Tucker provides the perimeter defense for the Suns. Up front, Markieff Morris leads the team in rebounding at 6.5 per game, but spends much of his time on the perimeter in the mid-range. After having a breakout season, Miles Plumlee has regressed quite a bit, which has hurt the Suns’ interior play. The Suns feature one of the more offensively dangerous benches in the league, as Gerald Green, Isaiah Thomas, and Marcus Morris can all go off for 20 points in a game, easily. 1. Guard Play – So much of the Suns’ identity is dependent on guard play. Their recent struggles coincided with the 8-game absence from Isaiah Thomas due to a bruised ankle. The Suns’ strongest line-ups usually involve the trio of Bledsoe, Dragic, and Thomas. Luckily, the Thunder have options that can defend such a line-up. Don’t be surprise if Ish Smith gets some minutes in this game to counter the Suns’ guard play. 2. The Interior – The Suns’ biggest weakness is their lack of an interior presence. In the last two weeks, the Suns have allowed Tyson Chandler to grab 18 boards, and Andre Drummond and DeAndre Jordan to grab 14 board each. While the Thunder don’t necessarily have a rebound-inhaler like those 3 guys, their big man can rack up the rebounding numbers if the opposing team is weak on the interior. 3. 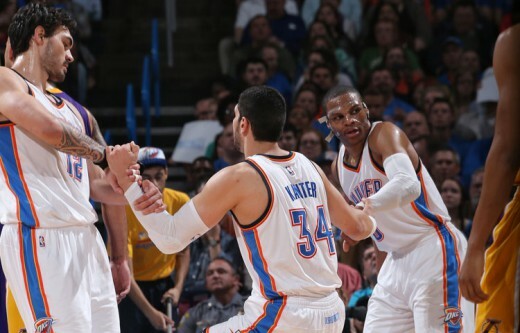 Playoff Intensity – It’s early, but the Thunder have to come out and assert themselves. They’ve been fortunate to have all the pieces come together during a stretch where they’ve played some of the worst teams in the league. This “mini training camp” has been instrumental in developing chemistry. But now, it’s time to put all that practice to work. Season preview – While one team gets embroiled in a controversy related to race (Atlanta), another team is getting out of their racial controversy relatively unscathed. 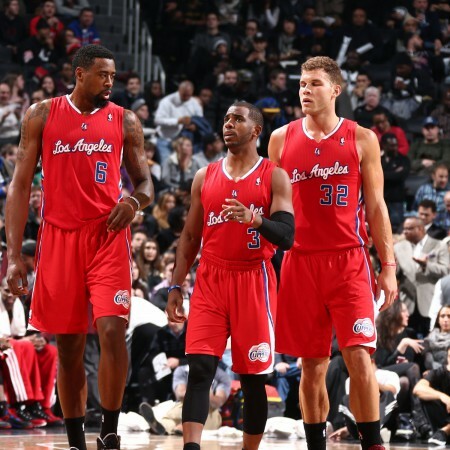 With the Donald Sterling fiasco behind them, and with new ownership, the Clippers look to build on the success from last season. The highest scoring team in the league (107.9 ppg) brings back its main core, while also adding the perimeter shooting of Spencer Hawes and Chris Douglas-Roberts to the mix. Chris Paul and Blake Griffin are legit MVP contenders and the Clippers should be in the thick of things when it comes to championship contenders. Season Preview – Golden State is one of those teams that seems to be on the cusp of becoming an elite team, but is missing that extra “oomph” to get them there. Unfortunately, whatever that oomph is was obtained in the offseason. The Warriors basically bring back the same team from last season. While Curry and Thompson may continue to get better, the rest of the team, for the most part, has already plateaued in terms of skill improvement/refinement. I see the Warriors still being good, but also, still not being good enough. Season Preview – The Eric Bledsoe contract situation has the ability to cast a huge shadow on this season for the Suns. After the feel good story that was last season, the Suns appear headed for a fork in the road with this Bledsoe situation. If he signs his 1-year qualifying offer, that could play out any number of ways, with some of those options blowing up in the Suns’ face. The Suns may be forced to trade Bledsoe, in order to keep Goran Dragic, who is an unrestricted free agent in 2015. All in all, I see this Bledsoe situation being too much of a distraction throughout the season for them to continue with what they started last season. Add to that the fact the Suns will no longer be able to sneak up on teams, and you are looking at a team-wide “sophomore slump”. This team will score a ton of points, and will be fun to watch, but will they be able to stop elite team on the other side of the court? 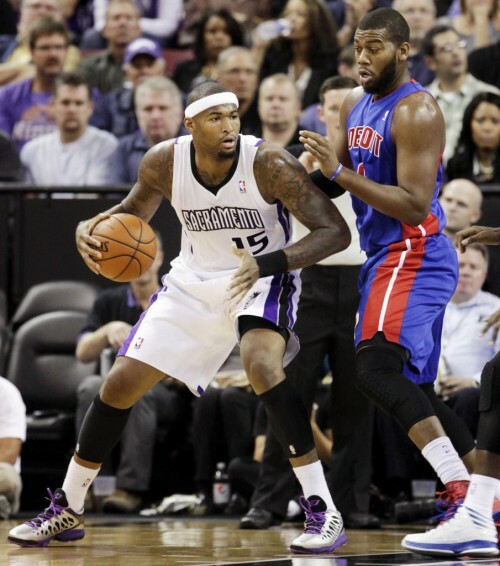 Season Preview – The Kings seem to finally be on the upswing. They are starting to assemble a team around DeMarcus Cousins, with shooters on the outside (Ben McLemore and Nik Stauskas) and rugged enforcers/rebounders on the inside (Reggie Evans and Jason Thompson). Rudy Gay will provide further perimeter scoring and Darren Collison will attempt to quarterback the whole thing. They will continue to fall short due to the weakness of the point guard position, but the maturation of Cousins will start to point the ship in the right direction. I wouldn’t be surprised if the Kings make a play for Rajon Rondo sometime this season. 2014-15 will be successful if: The Kings surpass 35 wins. Season Preview – As someone who respects Kobe Bryant, this is not how I envisioned his final years. 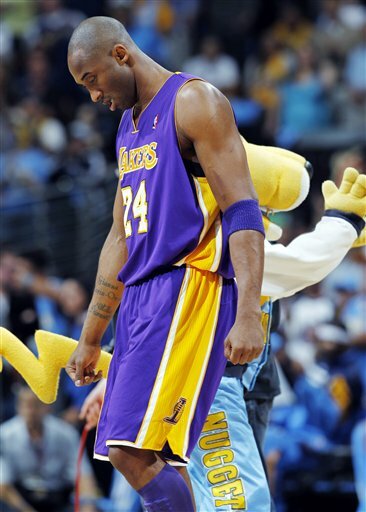 The Lakers are going to struggle, and struggle bad. Kobe may have a couple Kobe games left in him, but Father Time remains unbeaten (unless your name is Timothy Theodore Duncan). The Lakers are loading up on short contracts to coincide with the end of Kobe’s contract. Then, the Lakers will look to do what the Lakers usually do: lure top talent with the auspices of Hollywood glitz. But until then, it will be a lot like Lolo Jones’ performance on Dancing With the Star, which is to say cringe-worthy. Summertime Blues: What’s Left To Do? This is always the most boring part of the year for me. Summer league is over with, most of the free agents have signed, the FIBA World Cup is still a month away, and football training camps just started. I like baseball, but not enough to pay attention to it day in and day out. In addition, the stability of the Oklahoma City Thunder franchise makes time seem to drag even more. Don’t get me wrong, though. I enjoy the stability of the team. Our superstars and role players are all signed and the roster, for the most part, is already set. But the work of an NBA GM is never done. It is during these quiet times that GM’s get most of their leg work done for future moves. Thunder GM Sam Presti has done a great job of creating a stable environment, but there is still work to be done before the season starts. Here are 3 issues the team still wants to take of before the season starts. 1. 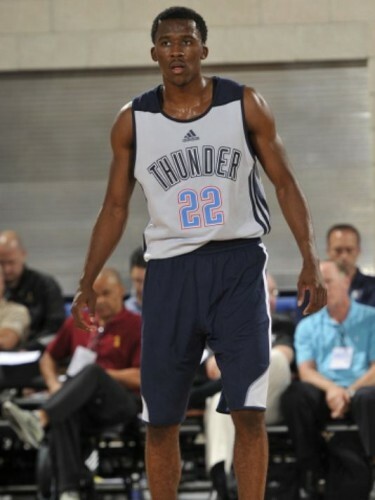 What to do with Semaj Christon? Much like Grant Jerrett from last season, the Thunder see a lot of potential in their 2nd round pick-up from this draft. Christon is the prototypical Thunder point guard: long, athletic, and able to get into the lane. What he lacks is consistent perimeter shooting and experience as a floor general. The Thunder saw a little of what Christon is able to produce during Summer League. He averaged 11.3 points, 2.3 rebouds, and 2.8 assists on 48.5% shooting from the field. He played in 4 games and averaged 26.3 minutes per game. He showed a penchant for being a good on the ball defender and averaged 1.3 steals per game. This is a prime example of what the Thunder look for in a point guard. With Russell Westbrook, Reggie Jackson, and Sebastian Telfair already on the roster, the point guard quota for the Thunder is filled for this season. 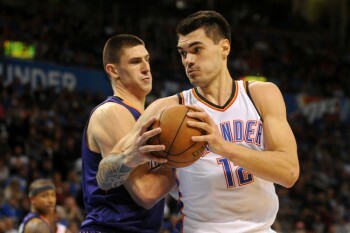 The question is how do the Thunder hold on to Christon without having a roster spot to offer him? Barring a late offseason trade, the Thunder already have the 15 players they will be going into the season with. Will they maneuver another Jerrett-like move to hold onto Christon’s draft rights through their D-League affiliate? One thing that may be in the Thunder’s favor is the loyalty they showed to Jerrett last season. Jerrett went along with the move the Thunder made to rescind his rights before training camp, but draft him in the D-League draft. At the end of the D-League season, the Thunder brought Jerrett in for the last week of the season and for the remainder of the playoffs. Christon may see this and give the Thunder a chance to develop him in the D-League with the thought that he might be brought in at the end of this season or next season. The Thunder have been including Christon in a lot of their community related activities this offseason, so it’s obvious they see him as a part of their future. Since 2010, one of the questions asked every offseason for the Thunder is whether Tibor Pleiss would finally come over. 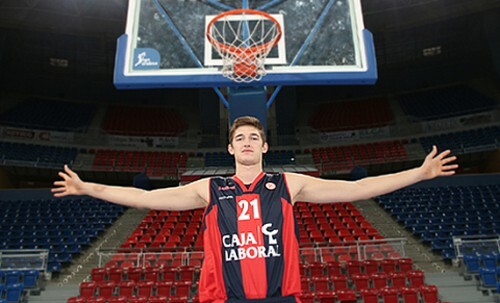 The Thunder drafted the German big man with the 31st pick in the 2010 NBA draft and expected him to stay in Europe for a couple seasons to further his development. But with Pleiss turning 25 this year, it’s getting to the point where the Thunder either bring him over and see what type of player they have, or they move on and Pleiss becomes one of those names that gets included in a trade as filler. With the calendar nearing August, it was almost a foregone conclusion that Pleiss would stay in Europe this season. The Thunder, on the other hand, aren’t necessarily in need of a big man. 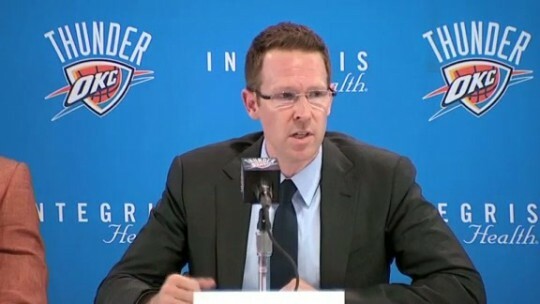 They already have Kendrick Perkins and Steven Adams in tow, and have a team option for Hasheem Thabeet. Next offseason is a different story. Perkins will be an unrestricted free agent after this season, as will Thabeet if the Thunder pick up his option. The Thunder have until September 1st to make a decision on Thabeet. If they don’t waive him before that date, his salary becomes fully guaranteed. It would make sense for the Thunder to bring Pleiss over this season in order to get him acclimated to playing in the NBA. If he’s going to be the primary back-up next season, he’ll need the experience. Plus, the Thunder have to see what they actually have in Pleiss. The only drawback will be the departure of Thabeet, whom the team loves as a locker room/chemistry guy. From a basketball perspective, though, it would be the best move to bring Pleiss over. Other than signing a 3-point shooter, no other move would complete this offseason like signing Reggie Jackson to an extension. Jackson just completed his third season in the league, which makes him eligible for an extension with his current team. If the Thunder fail to sign Jackson to an extension this offseason, then they risk him going into restricted free agency next offseason. This is a scary thought because if a team with cap space offers Jackson a lucrative contract, then the Thunder may have to turn it down and allow Jackson to walk away with nothing to show for it. The question becomes, “What is Jackson worth?” He’s a 6th Man of the Year candidate with the skills (and chops) to be a starter in the league. In the past year, Jackson has filled in admirably in Westbrook’s absence due to injury, and has been part of the Thunder’s finishing line-up when Westbrook has been healthy. The Thunder, and Jackson, for that matter, are probably paying close attention to what happens in the Eric Bledsoe/Phoenix Suns contract negotiations. Jackson’s situation is very similar to Bledsoe’s, who was a 6th Man of the Year candidate for the Los Angeles Clippers, playing behind Chris Paul, before getting traded to the Suns where he became a full time starter. The Suns recently offered Bledsoe a 4 year/$48 million dollar contract, which Bledsoe rejected. 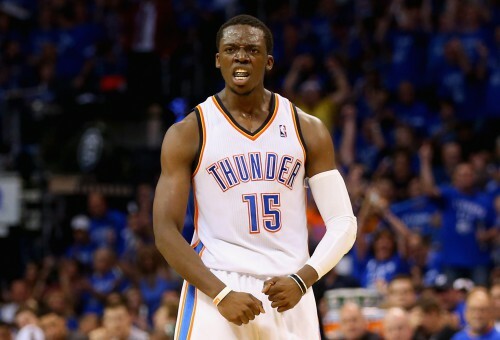 To the Thunder, Jackson is not worth $12 million a year. With max level contracts for Durant and Westbrook already in the books, and Ibaka receiving $12.3 million per season, the Thunder can’t really give out another max or near-max level contract. With Perkins and his $9.4 million dollar contract coming off the books after this season, the Thunder could hypothetically offer Jackson a 4 year, $30 million dollar contract. Anything more than that, and the Thunder are compromising their ability to sign Durant, Westbrook, and Ibaka to future extensions. Besides the money, another sticking point may be Jackson’s desire to be a full-time starter in the league. In his exit interview, Jackson made that desire known to the public. The Thunder like to start a traditionally sized, defensive minded shooting guard in the Thabo Sefolosha mold and probably would not commit to starting a duel combo guard starting line-up. In Jackson’s mind, if he’s able to get the money and the starting job, he may be willing to wait out this year and go to restricted free agency next season. If that’s the case, the Thunder may just have themselves another James Harden situation. 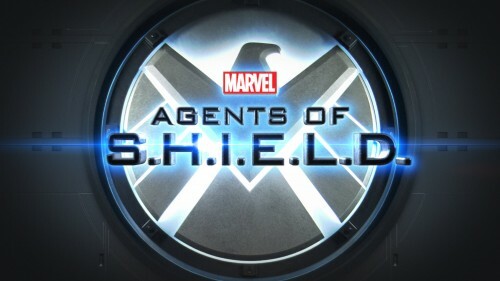 I have really enjoyed this first season of ‘Agents of S.H.I.E.L.D’. Many critics have panned it, but I think it has melded well with the Marvel movie universe, and has enough gumption to stand on its own. This season has focused on their hunt for The Clairvoyant, a villain who always seems to be one step ahead the agents. So much so, that the agents start to think the villain is in their head. Well, I would like to let the agents of S.H.I.E.L.D know that I have found The Clairvoyant. His name is Matthew Winick, and he’s the mastermind behind the NBA schedule. He has to be The Clairvoyant. Who else would’ve scheduled the Dallas Mavericks, Phoenix Suns, and Memphis Grizzlies to play each in round robin fashion in the final week of the season for the 8th seed in the Western Conference. 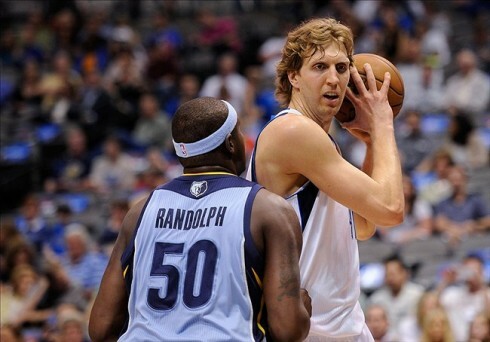 Dallas owns the tie breaker versus Memphis (3-0)and is tied with Phoenix (1-1). Phoenix is tied with Dallas (1-1). With Dallas holding a 1/2 game lead over the Suns and a 1.5 game lead over the Grizzlies, they are firmly in the driver’s seat. But the teams they face in their final 3 games have a winning percentage of .654. It doesn’t get any easier for Phoenix, whose four remaining opponents have a combined winning percentage of .577. The easiest trek may be Memphis’, which currently sits in the 9th position in the West. They play the 76ers and the Lakers before beginning their round robin games against the Suns and Mavs. They are in a much better position than Phoenix to control their destiny. 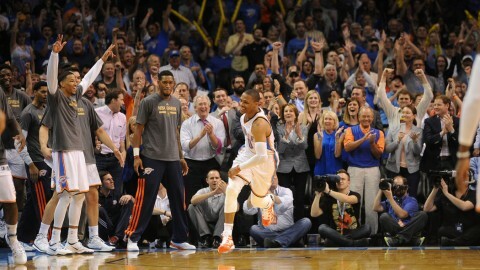 With the Oklahoma City Thunder firmly in control of the No. 2 seed in the West after last night’s victory over the Los Angeles Clippers, my focus can be redirected towards the West’s 8th seed. Those three teams will be battling for the 7th and 8th seed. Other than who might finish with the 7th seed, how does this affect the Thunder? The answer to that lies in San Antonio. There’s still a sliver of hope the Thunder can get the No.1 seed in the conference, and in the league. 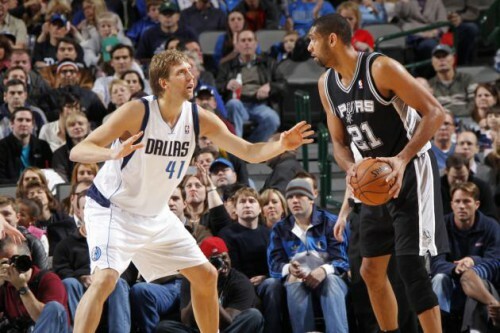 That hope lies in the fact that the Spurs will face the Mavericks and Suns on back to back nights. Two desperate teams against a team that is known to rest its starters as the season winds down. Tony Parker will be out for tonight’s game against the Mavericks. After they face the “duo of desperation”, the Spurs then travel to Houston to face the Rockets, who may be needing to win in order to stay ahead of the Portland Trailblazers for the 4th spot (and final home court position) in the West. All told, if the Spurs finish 1-3 in their final 4 games, and the Thunder win out, Oklahoma City will head into the playoffs with the No. 1 seed. A lot of things will have to fall in OKC’s favor, but it’s not an impossible scenario. With the Spurs playing 2, or possibly, 3 desperate teams, the onus may be on them to hold on to the top seed in the West.